As winter continues to be well, winter, plants that normally are blooming by now remain tightly closed buds. For this Monday’s vase I repurposed flowers from the last two arrangements, both arrangements had held up nicely. The hot pink cyclamen from last week continues to look perky. 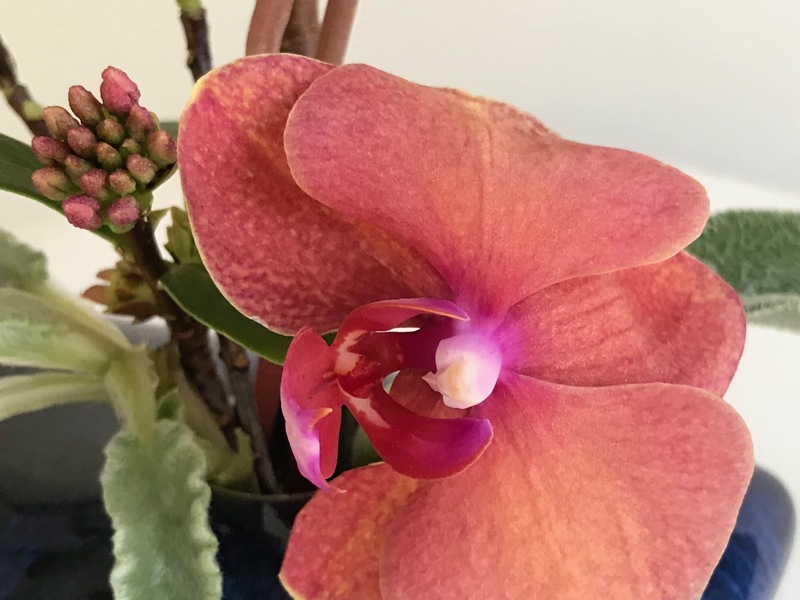 The salmony moth orchid from two weeks ago lost one of its blooms but lasted better than expected as a cut flower. Daphne looks worse for the wear after the extreme cold this winter and several snows. Most of the leaves are browned and damaged. 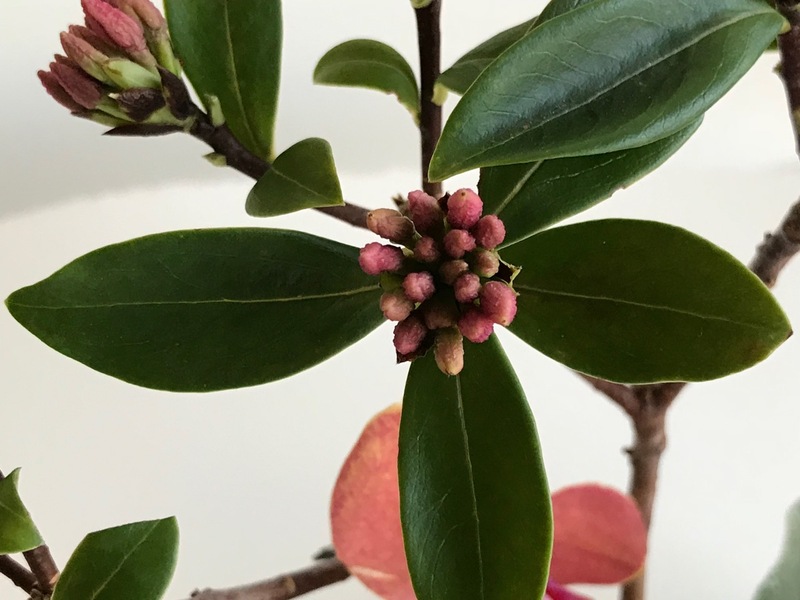 Buds display pink color but not even a random one has opened yet. But to use for foliage today I managed to pick a branch from a few that sit beneath the eave of the house. Just a few inches difference in position means it has been moderately protected from the elements. A few pieces of Lamb’s Ear drape near the opening of the container. 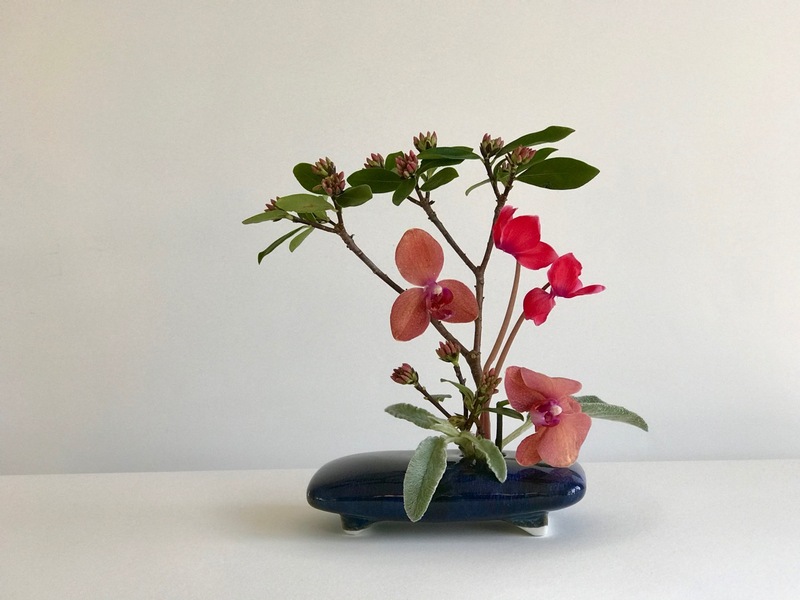 Again this week I have chosen an Ikebana vase to showcase the design. Its integrated floral pin or frog make positioning the materials quick and secure. 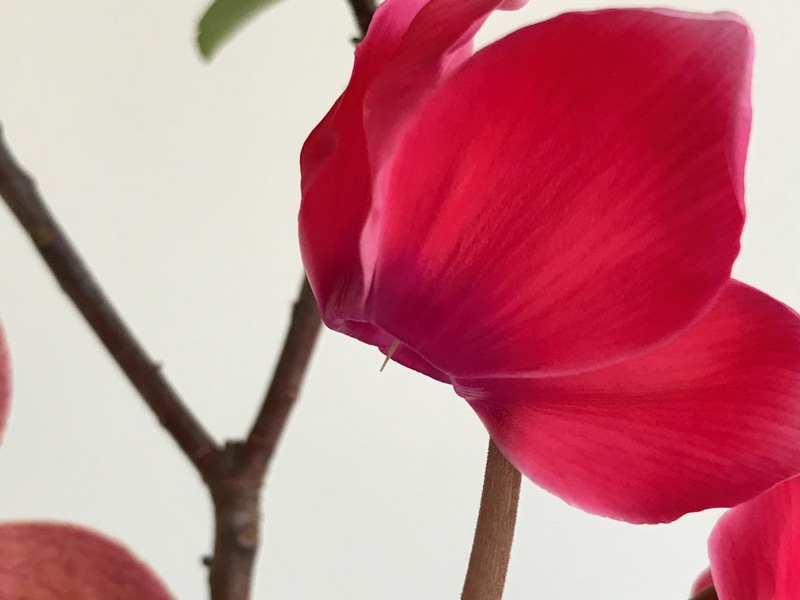 This entry was posted in garden and tagged 2018vase, cyclamen, Daphne odora, flower arranging, flower design, in a vase on monday, nature photography, Phalaenopsis on February 5, 2018 by pbmgarden. This is a very successful design Susie and all the more clever because you have reused material from past vases. Thanks Christina! I’m getting anxious for finding blooms outdoors again. There are a few signs… I see you’re traveling. Have fun! It was fun! I’ll do a post even though it isn’t gardening! Hope it warms up for you soon. Yes, we’ve had enough winter now. Your Ikebana vase has come up trumps again. So elegant and such a lovely colour scheme. Thank you! Winter has made its mark this time, sometimes its merely a blip and gone but this year has persisted. What a pretty cyclamen, love the vivid color. Seems we typically have a little turn for the better around Valentine’s Day, so I’m crossing my fingers for warmer temps soon. Yes, it will come and I should be straightening up the garden now! So nice to hear from you. Have been wondering how you’re doing. I am regretting I couldn’t commit to attend your conference this year. Such a feast for the eyes, and so creative. Thanks Donna. Having so few blooms choices has forced me to experiment more. 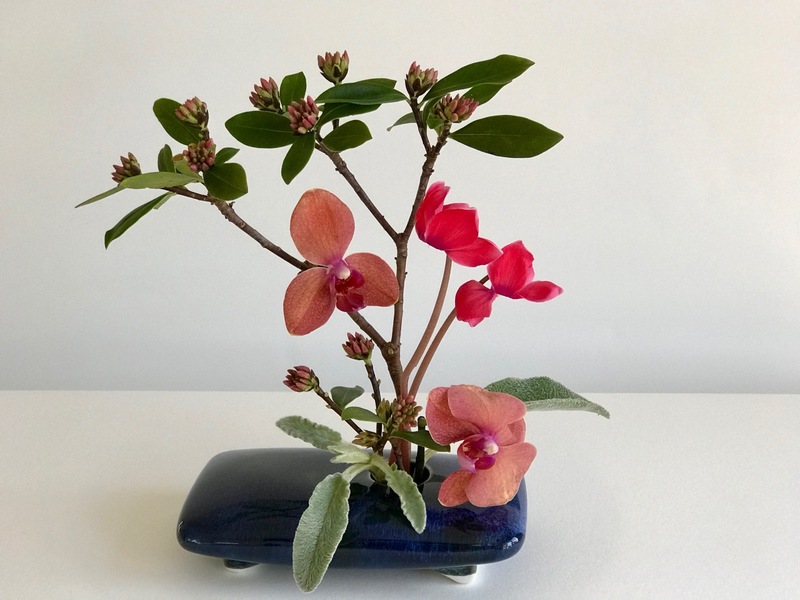 Recycled ikebana! I love it,the layers look like a good perennial garden design and a good floral design. I could never grow Daphne in Atlanta, kudos to you. Daphne is treat this time of year (although mine hasn’t actually opened yet, I can imagine that fragrance). My mother had a huge Daphne we planted on gravel! Enjoy your treat. 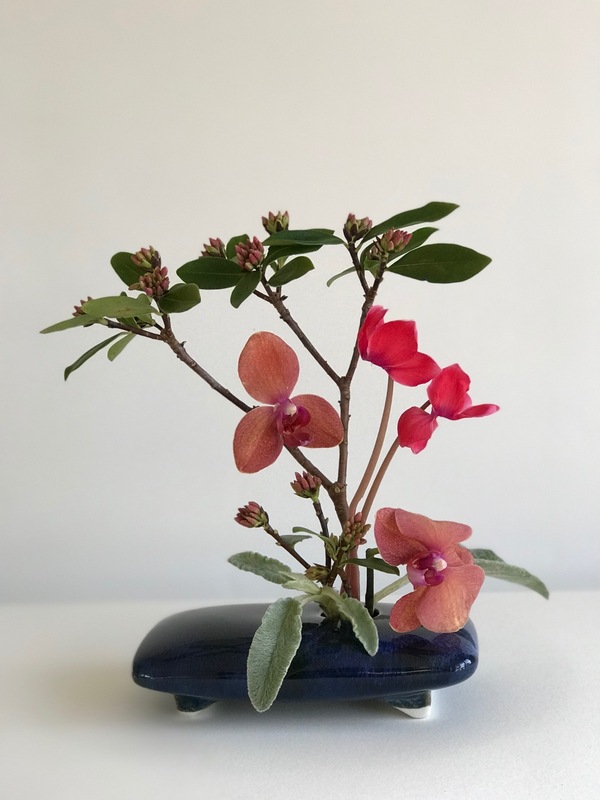 You are one of the few people who participate in IVOM who uses an Ikebana vase and I think it is such a great container. You don’t need much to fill it and every flower and leaf gets attention. I am a big believer in recycling, removing and adding to bouquets as time goes by. So I like today’s offering on all those counts. Thanks Linda. 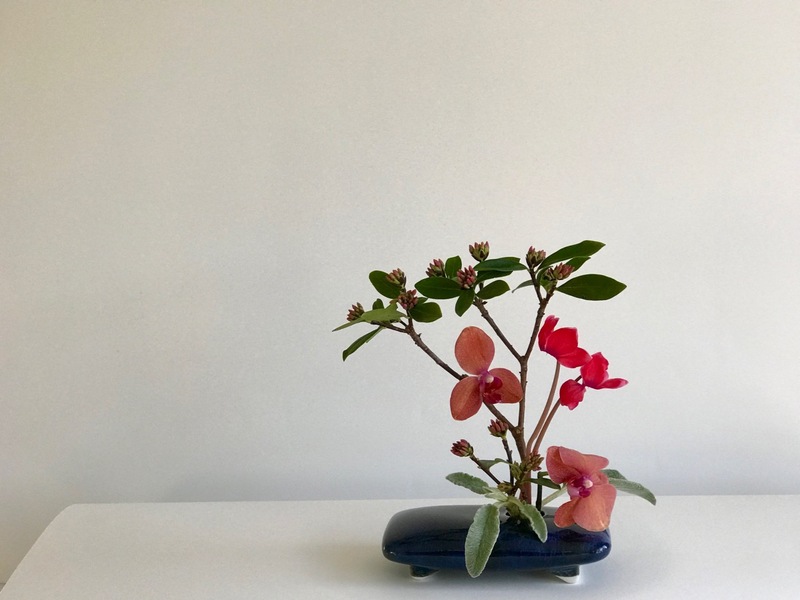 I like Ikebana vases for all the reasons you cited. The minimalist in me appreciates the form. What a great recycling of previous material, Susie – all the elements work perfectly together and the end result is well balanced. Lovely! Thanks Cathy. It was fun to do this mix and match arrangement today. Another artistic creation worthy of admiration, Susie! I’ve found that orchids are very good vase material. Like Leucadendrons, they can hang on for weeks. Thanks Kris. In the past orchids haven’t lasted for me more than about 5 days so I’m excited. Perhaps this one was fresher. Ooh, that is a weird one. Cyclamen with a moth orchid! I have not done the ‘In a Vase on Monday’ yet because I do not grow enough flowers, but mostly because I would not know what to do with them if I had them. There are no rules except for growing what you place in a vase (and even that rule can be breached). The weather is certainly trying but you have found some treasures. The integrated pin sounds very useful and must save much fiddling about. Thanks Alison. Yes, having that floral pin saves a lot of work and helps stabilize the materials. Good choices! The colors work so well together, and the forms and shapes of the flowers, buds, and foliage create excitement. Perfect in that vase, too. Thanks Beth. It’s nice to have a vase of flowers to brighten the indoors while we wait out this winter. Hope you’re doing well. This is just so cheerful and pert! A refreshment for the eyes. Thank you. I’m delighted you enjoyed it. It is aging ever so gracefully. Thanks Jason. I need to fertilize the plants as the don’t seem to be producing blooms well the year.